﻿ France - Velodyssey Cycling from Bordeaux to Biarritz. France - Velodyssey Cycling from Bordeaux to Biarritz. Ride out to meet nature, heritage and culture of the “Gironde, Landes and Basque Country”! Explore landscapes through the Velodyssey or Velodyssée, the longest waymarked cycling track in France and Europe, a peaceful and tonic ride all along the coast! These six stage bike tour will lead you from « Bordeaux » a UNESCO World heritage city to the famous seaside resort of « Biarritz ». This ride takes you from lakes to beaches, going through the largest forested area in Europe called the Landes de Gascogne. Discover a variety of landscapes: salt marshes, dunes, forests, large beaches surrounded by pine trees and intimate lakes along your trip. Breathe the air of the sea, the perfume of the pine trees, mimosa and brooms. Conviviality and French Southwestern Art de Vivre is surely one of the main features of this cycling holiday. All along the coastline there are many restaurants, bars to have a drink. You won’t be starving or thirsty! There are many places to meet and chat with people. Fully equipped Hybrid bikes can be provided, and your luggage transferred at every stage. After each riding day you will enjoy the hotels and Guest Houses carefully chosen (2 or 3-star/4 star in Biarritz). English detailed road book and phone assistance included in the package. Arrive at your 3-star hotel in Bordeaux, where the road book and bikes wait for you. « Bordeaux », named before “Burdigala”, is a Roman city, inseparable from its vineyards and prestigious stone architecture classified Unesco World Heritage. 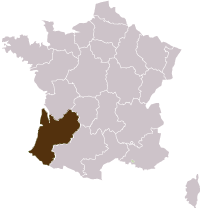 Your cycling tour in Aquitaine takes you from « Bordeaux », the Wine capital to « Lacanau-Ocean » a seaside resort. Take the Green Way, a cycle path that follows a former railway track « Bordeaux-Lacanau ». It is a beautiful easy and secured route, which goes through the pine forest. Listen to the cicadas in Summer.! Ride whether on a cycle path or on forest trails. Long ocean beaches sheltered by dunes, forests and lakes : enjoy your ride in this unspoilt natural area. Ride only on cycle path and discover the largest wild beaches of the Aquitaine coast; a 13 km beach without any building. To enjoy it leave from time to time the track of the cycle path. Never far away from the shore line, continue your cycling tour through a beautiful itinerary towards the « Cap Ferret » or the « Bay of Arcachon »*. End the cycling day in the typical oyster villages of the « Bay of Arcachon » and take the ferry to the the renowned seaside town of «Arcachon ». Overnight in a 3-star hotel with breakfast. optional day in Arcachon Bay : *For those who wish to enjoy more time around the « Bay of Arcachon » and its typical ports it is possible to spend an extra night around « Andernos » and to continue your cycling tour the next day around the Bay to the iconic city of « Arcachon ». Start your ride towards the « Great Dune of Pyla », and climb up to the top of this sandy mountain to appreciate the beauty of the site. Don't leave the “Bay” before having a look at it! Then cycle under the pines of the Landes forest. 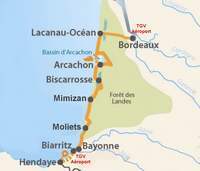 The velodyssey, just after leaving the Gironde enters now into« Biscarrosse Plage » in the Landes area. Overnight in a 3-star hotel. Breakfast and dinner included. The Velodyssey leaves the coast to make a wide detour inland, where the blue of the vast lakes replaces the Ocean. Discover the « lake of Cazaux and Sanguinet », the second largest lake of France (5800 ha ! ), a heaven surrounded by greenery and pines. Then ride alongside the « lake of Biscarrosse and Parentis ». Further, the cycle path takes you to the Landes forest and reaches the ocean in « Mimizan Plage ». « Mimizan » dates back to the “Belle Epoque” when sea bathing became fashionable and was very much popular among wealthy tourists. Overnight in a charming Guest House or charming 2-star hotel with breakfast included. This is is a pleasant stage, quiet and calm through wooded areas and embellished by the scent of the pine forest. Let yourself be carried by the sea air and enjoy the nearby ocean beaches leaving from time to time the track. Then discover « Contis Plage », « St Girons Plage » as well as the beaches of « Leon lake ». End your cycling day in another attractive seaside town, Moliets. Last stage of your cycling holiday before you leave the “Landes”. The cycle path takes you again in the heart of the forest to discover the emblematic famous surfers seaside towns of « Hossegor » and « Capbreton ». Enjoy the large beaches and continue through more urban areas as it approaches « Boucau ». Welcome in a new scenery of the Atlantic coast: “The Basque Country”. Ride on a pleasant cycling path and go through its capital, « Bayonne » to rejoin the renowned seaside town of « Biarritz ». This stage can be shortened by 20 km with a stopover in Capbreton or Hossegor. End of the cycling tour in Biarritz after breakfast. You can add a few optional nights there to enjoy the lively and unique city and sunbathing well deserved ! You can continue the cycling adventure in the Basque Country with our tour Cycling in the Basque country starting in Biarritz. Another option is to add one more riding day to Hendaye and Spain, Hondarrabia. The bicycle (VTC: Hybrid bike for men or women). Locks, helmet, handlebar bag, repair kit, pump. Repatriation of the bikes. Assistance. The meals Drinks and personal purchasing. This bike tour can be extended to Hendaye and Hondarrabia in Spain with one more riding day. If you want more rest days during the trip to enjoy the beaches longer ask for more nights or shorter stages. Access : TGV Station or international airport in the 2 cities. Customize your tour : add or remove one night or more, combine with another tour !